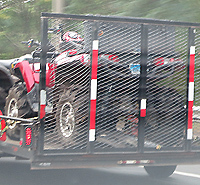 These plates are used on off-road recreational vehicles. I believe this type started in the 1970s with motorcycle-sized blue on white plates and an A prefix, working their way through B, etc. All-Terrain new dealer plates are also issued, with in an X1 123 format. When the graphic base was started, “All-Terrain” lost its hyphen and became “All Terrain”. These plates began with the “G” series, and four numbers are now used after the letter prefix.